The addition of managed futures to a client's portfolio does not mean that a portfolio will be profitable or that it will not experience substantial losses and that the studies conducted in the past may not be indicative of current time periods or of the performance of any individual CTA. 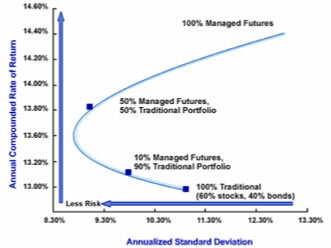 Managed Futures offer the opportunity to reduce the volatility risk of a traditional stock/bond portfolio. Modern Portfolio Theory was developed by the Nobel Prize winning economist Dr. Harry M. Markowitz. He stated that a portfolio’s efficiency can be increased by diversifying across asset classes that have low to negative correlations. The goal is to decrease the portfolio’s volatility risk. The following table show the correlation between stocks, bonds, and managed futures. Two perfectly correlated investments (ones that move in the same direction to the same degree) would have a correlation of 1.0 while a perfectly negative correlated investments (ones that move in the opposite direction to the same degree) would have a correlation -1.0. The goal is to combine investments that have a low correlation. Correlations between -0.5 and +0.5 would be desirable. 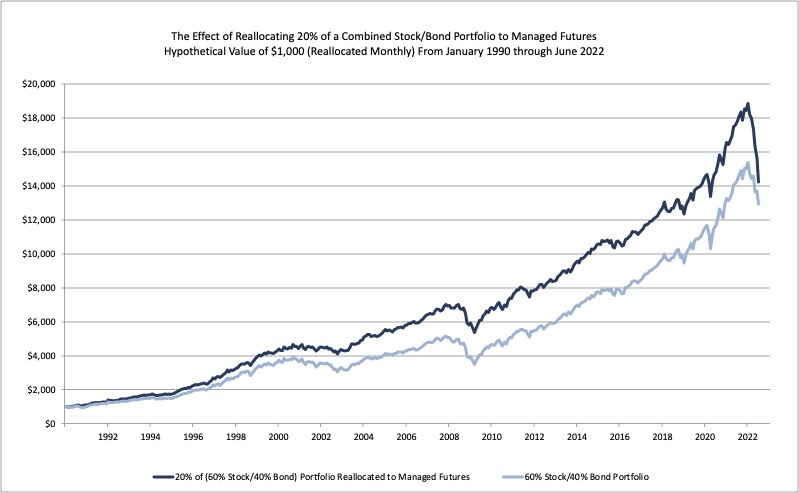 The chart below illustrates how reallocating 20% to a Managed Futures Portfolio (based on the results of the AG CTA Index) to a traditional portfolio of 40% bonds (based on the Barclay Bank's Aggregate Bond Index) and 60% stocks (based on the S&P 500 Price Index) since January 1990. Goldman Sachs conducted a study regarding the ability of futures to enhance the returns of a traditional investment portfolio. The study covered a 25-year period and concluded that by “..allocating only 10% of a securities portfolio to commodities, investors can vastly improve their performance." This conclusion was supported by another study published by the Chicago Mercantile Exchange (“CME”), one of the world's leading futures exchanges. According to the CME study, "Portfolios with as much as 20% of assets in managed futures yield up to 50% more than a portfolio of stocks and bonds alone." Managed futures investors can profit in many different types economic environments. This is partly because the futures markets are diverse and often exhibit independent price movement. Commodity Trading Advisors can take advantage of price trends regardless of whether the market is rising or falling. For instance, if they feel that the markets have the potential to rise then they can buy in anticipation of a price increase. Conversely, if they anticipate the market to fall then they can sell short. There is no restriction on short selling in the futures market as in the stock market. During periods of hyperinflation, hard commodities such as precious metals, energies, grains, livestock, and currencies often do well. During deflationary times, the futures markets can provide an opportunity to profit by selling short in a falling market with the expectation of buying back the position at a lower price. CTAs can also use sophisticated spread strategies that combine futures and options on futures positions in an attempt to profit during periods of flat or neutral markets. Trading and risk management strategies that endeavor to balance risk with reward. The chart below demonstrates how the Autumn Gold CTA Index performed during periods when the S&P 500 TR Index experienced quarterly losses greater than 10%. The Autumn Gold CTA Index reflects the average performance of Commodity Trading Advisors (CTAs) reporting to the Autumn Gold Database. The chart demonstrates that the Autumn Gold CTA index outperformed the S&P 500 TR Index during periods when the S&P 500 TR Index incurred quarterly losses in excess of 10%. In every instance, when the S&P 500 TR Index incurred these losses, the Autumn Gold CTA index produced positive returns or losses less than 2%. The chart below demonstrates how the Autumn Gold CTA Index performed during periods when the S&P 500 TR Index experienced quarterly gains greater than 10%. The Autumn Gold CTA Index reflects the average performance of Commodity Trading Advisors (CTAs) reporting to the Autumn Gold Database. The chart demonstrates that the Autumn Gold CTA index produced gains or minimal losses during periods when the S&P 500 TR Index incurred quarterly gains in excess of 10%. In every instance, when the S&P 500 TR Index incurred these gains, the Autumn Gold CTA index produced positive return or losses less than 2%. How does this benefit an investor’s portfolio? The charts below show the result of adding 30% to a managed futures portfolio (based on the Autumn Gold CTA Index). During quarters that the S&P 500 TR Index was down more than 10%, reallocating 30% of the portfolio to managed futures would have reduced the severity of the portfolio's quarterly losses. During quarters that the S&P 500 TR Index was up more than 10%, reallocating 30% of the portfolio to managed futures did not significantly lower the portfolio’s quarterly gains. Thus in this analysis the reduction of volatility outweighs the reduction in return. For Chart 1 - Stocks are represented by the S&P 500 Total Return Index from December 1990 to the end of Data and by the S&P 500 Price Index adjusted for dividends from January 1990 through November 1990. The S&P 500 indices are designed to reflect all sectors of the U.S. equity markets. The S&P 500 includes 500 blue chip, large cap stocks, which together represent about 75% of the total U.S. equities market. Companies eligible for addition to the S&P 500 have market capitalization of at least US$3.5 billion. The TR Index accounts for the reinvestment of dividends. Bonds are represented by the Barclay's US Aggregate Bond Index (formerly known as the Lehman US Aggregate Bond Index). The U.S. Aggregate Bond Index is a broad-based benchmark that measures the investment grade, U.S. dollar-denominated, fixed-rate taxable bond market, including Treasuries, government-related and corporate securities, MBS (agency fixed-rate and hybrid ARM pass- throughs), ABS, and CMBS. The U.S. Aggregate rolls up into other Barclays Capital flagship indices such as the multi-currency Global Aggregate Index and the U.S. Universal Index, which includes high yield and emerging markets debt. The U.S. Aggregate Index was created in 1986, with index history backfilled to January 1, 1976. 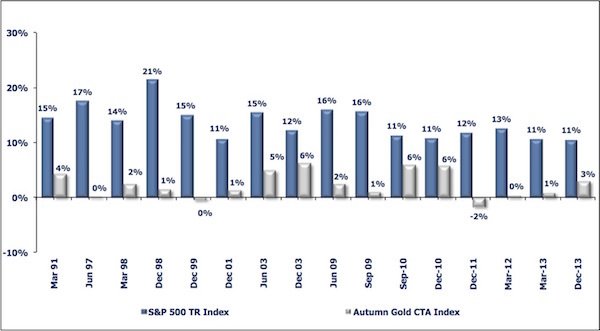 Managed Futures are represented by the Autumn Gold CTA Index. The Autumn Gold CTA Index is comprised of the client performance of all CTA programs included in the AG database and does not represent the complete universe of CTAs. CTA programs with proprietary performance are not included. Monthly numbers are updated until 45 days after the end of the month. THE RISK OF TRADING COMMODITY FUTURES, OPTIONS AND FOREIGN EXCHANGE ("FOREX") IS SUBSTANTIAL. THE HIGH DEGREE OF LEVERAGE ASSOCIATED WITH COMMODITY FUTURES, OPTIONS AND FOREX CAN WORK AGAINST YOU AS WELL AS FOR YOU. THIS HIGH DEGREE OF LEVERAGE CAN RESULT IN SUBSTANTIAL LOSSES, AS WELL AS GAINS. YOU SHOULD CAREFULLY CONSIDER WHETHER COMMODITY FUTURES, OPTIONS AND FOREX IS SUITABLE FOR YOU IN LIGHT OF YOUR FINANCIAL CONDITION. IF YOU ARE UNSURE YOU SHOULD SEEK PROFESSIONAL ADVICE. PAST PERFORMANCE DOES NOT GUARANTEE FUTURE SUCCESS. IN SOME CASES MANAGED ACCOUNTS ARE CHARGED SUBSTANTIAL COMMISSIONS AND ADVISORY FEES. THOSE ACCOUNTS SUBJECT TO THESE CHARGES, MAY NEED TO MAKE SUBSTANTIAL TRADING PROFITS JUST TO AVOID DEPLETION OF THEIR ASSETS. EACH COMMODITY TRADING ADVISOR ("CTA") IS REQUIRED BY THE COMMODITY FUTURES TRADING COMMISSION ("CFTC") TO ISSUE TO PROSPECTIVE CLIENTS A RISK DISCLOSURE DOCUMENT OUTLINING THESE FEES, CONFLICTS OF INTEREST AND OTHER ASSOCIATED RISKS. A HARD COPY OF THESE RISK DISCLOSURE DOCUMENTS ARE READILY AVAILABLE BY CLICKING ON EACH CTA'S "REQUEST DISCLOSURE DOCUMENT" BUTTON. THE FULL RISK OF COMMODITY FUTURES, OPTIONS AND FOREX TRADING CAN NOT BE ADDRESSED IN THIS RISK DISCLOSURE STATEMENT. NO CONSIDERATION TO INVEST SHOULD BE MADE WITHOUT THOROUGHLY READING THE DISCLOSURE DOCUMENT OF EACH OF THE CTAS IN WHICH YOU MAY HAVE AN INTEREST. REQUESTING A DISCLOSURE DOCUMENT PLACES YOU UNDER NO OBLIGATION AND EACH DOCUMENT IS PROVIDED AT NO COST. THE CFTC HAS NOT PASSED UPON THE MERITS OF PARTICIPATING IN ANY OF THE FOLLOWING PROGRAMS NOR ON THE ADEQUACY OR ACCURACY OF THE DISCLOSURE DOCUMENTS. OTHER DISCLOSURE STATEMENTS ARE REQUIRED TO BE PROVIDED TO YOU BEFORE AN ACCOUNT MAY BE OPENED FOR YOU. LIMITATIONS OF RANKINGS ARE THAT ONLY THOSE ADVISORS OR POOL OPERATORS THAT SUBMITTED THEIR PERFORMANCE DATA TO AUTUMNGOLD WERE RATED. THE ENTIRE CTA UNIVERSE IS NOT INCLUDED IN THE RANKINGS. THE PERFORMANCE INFORMATION PROVIDED WHEREIN HAS NOT BEEN VERIFIED BY AUTUMNGOLD. THE PAST PERFORMANCE IS NOT NECESSARILY INDICATIVE OF FUTURE RESULTS.